Real Madrid had no problem against MoraBanc Andorra and improved its ACB W-L record to 16-5. A couple of days after its loss to FC Barcelona Lassa, Real Madrid (16-5) easily took down Andorra (10-11), 87-66, at the Polideportivo. Pablo Laso’s side was no match for the hosts. 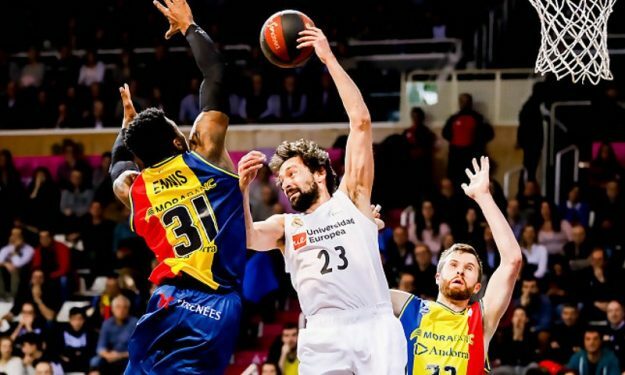 Jaycee Carroll ended up with 15 points, Sergio Llull poured 14 and Jeff Taylor had 11 of his own. The ACB Regular Season Round 21 featured one more Sunday morning contest. BAXI Manresa (12-9) overcame Movistar Estudiantes’ (8-13) fourth-quarter rally to achieve a 101-91 victory. Erik Murphy notched a game-high 20 points and Ryan Toolson added 18, also dished seven helpers.